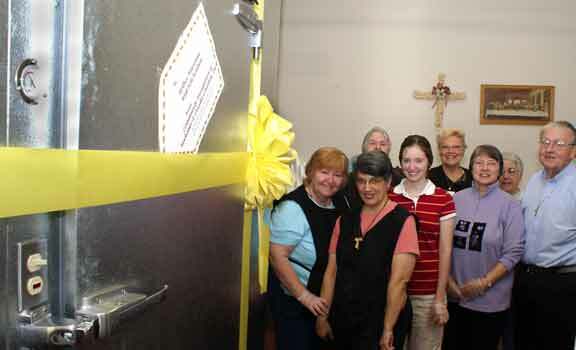 UTICA, Sept. 10, 2008 -- Mother Marianne’s West Side Kitchen on Sept. 10 held a ribbon-cutting and blessing for a walk-in freezer that was installed to meet the growing demand for assistance at the West Utica soup kitchen. The 7-foot by 9-foot freezer was made possible by a $9,899 grant from The Community Foundation of Herkimer and Oneida Counties, Inc., and its Richard W. Couper Memorial Fund and Leroy and Hazel Scheidelman Fund. Located in the St. Joseph-St. Patrick Parish Center at Columbia and Varick streets, the soup kitchen has seen a steady increase in “guests” since opening its doors March 10, Deacon Nadeau said. Deacon Nadeau said that in an effort to advocate on behalf of soup kitchen guests, he has met with staff at the Resource Center for Independent Living (RCIL). 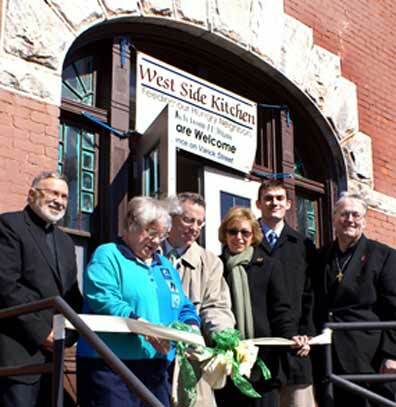 In June RCIL sent an outreach team to West Side Kitchen to see the need first hand. The team did a survey of 62 of the guests present that day, he said. “This has been a very humbling experience for all of us,” one RCIL staffer told Deacon Nadeau. -- 49 (or 70 %) needed employment. -- 41 (66 %) needed help with food. -- 40 (65 %) needed clothing. -- 33 (53 %) needed assistance with transportation. -- 21 (34 %) needed medical help. -- 17 (27 %) needed shelter. -- 14 (23 %) expressed the need for counseling. -- 13 (21 %) needed help with the cost of utilities. The soup kitchen is named after Central New York’s future saint, Blessed Mother Marianne Cope, who grew up in West Utica. The walk-in freezer was installed by Walters Equipment Service of Remsen and Vogel Electric of Yorkville. The Community Foundation has been a force for improving lives and promoting philanthropy throughout Herkimer and Oneida counties since 1952 and has made more than 3,800 grants totaling over $26.8 million. Grants are generated by more than 240 funds that comprise The Foundation’s endowment, established and advanced by area individuals and families.